Upon reading my DIY magazine last month, I was really excited at the tutorial for using nail polish to marble slick-surface furniture. The polish really sticks! Well, I don’t have any furniture pieces needing a new look but I wondered if the same materials could be used on non-furniture, non-slick surfaced items. My findings? They can! 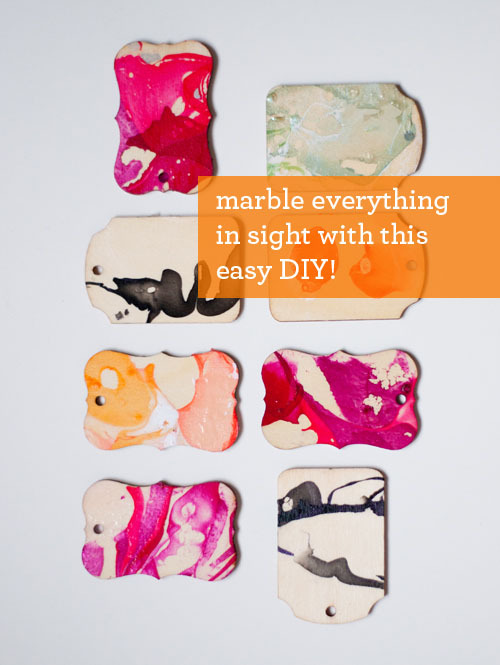 I did a bunch of experimenting and found that nail polish and water offer up an extremely easy way to marble just about anything you desire — from glass to wood to metal to cardboard. The options are endless! I used this nail polish marbling technique on glass jars, metal bowls, wooden gift tags, and papier-maché boxes. And with the seemingly limitless color selection in polish now a days, there is sure to be a color scheme to your liking. Come learn this technique! -fingernail polish – new is best for freshness and liquidity but price point is your choice! Also important, make sure the work area is well-ventilated. Nail polish is stinky stuff! Fill the tub with a couple of inches of water. Most of the time, only a few inches of water is needed. 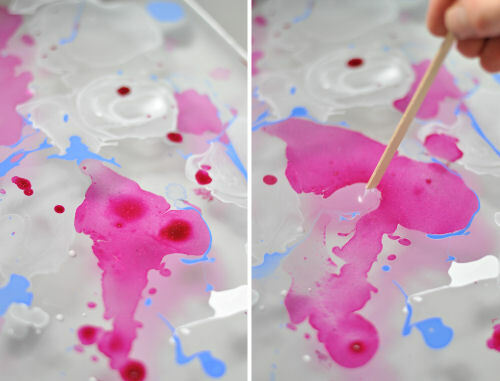 If you are marbling an especially deep object, add enough water that the piece can be submerged completely. Beginning dropping in the polish. The first color to hit the water will span out over the whole surface so beginning with a light color is best. Continue to add colors to your desire. However, you must work fast. With the fast-drying polish on the market, there is only a small window of time! If you can be fast and want to modify the polish, you can drag a wooden stick through the polish/water and creating various patterns and looks. Once you (quickly) have things just right, press your item to be marbled into the polish/water bath. There are two ways that I’ve found for transferring the polish to the object. 1.) You can, like the photo above, press your item straight down through the polish, into the water. This will cover the item on all sides, enveloping it in the surrounding pattern. And 2.) 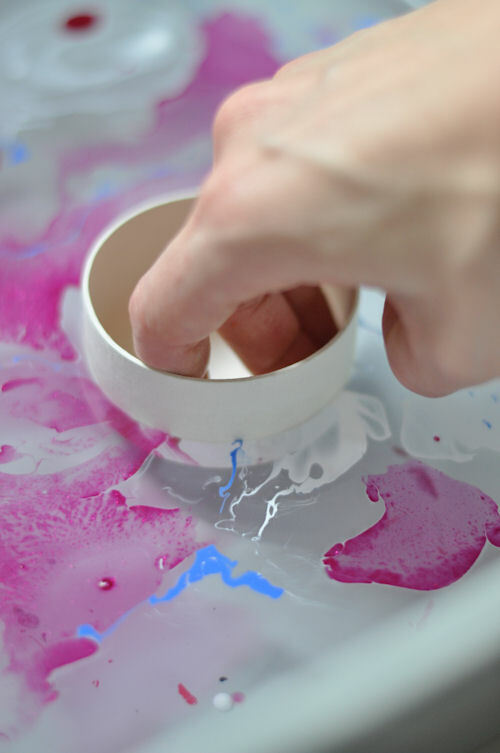 You can also ‘roll’ the object on the colored water surface, using the length of the tub to cover each side. This method works well on larger pieces that you don’t want to submerge or when a certain pattern is desired on all sides. Experiment and see what works best for you. Once the object has picked up the color, place on the scrap paper to dry. You may redip a piece if the marbling isn’t to your liking or there is a gap in the color. The polish dries rather quickly and the excess water can be wiped away. Thankfully the odor doesn’t stick around too long either. I found this nail polish marbling technique so satisfying that I’m kind of obsessed at the moment. I find myself collecting boxes and bowls and tags and what not just so I can marble them. : ) I’m already using upcoming holidays (hello Easter!) as an excuse for future projects. What about you? Does the marble look appeal to you? What sorts of things would you marble? 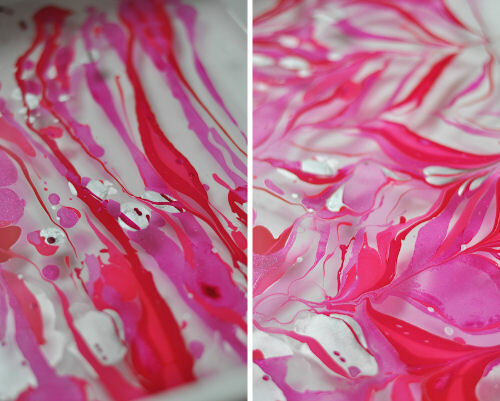 Have you tried nail polish marbling before? I do have a piece of furniture I’d love to do this to- can you tell me how to do it? I believe the technique is the same Rachel. A couple inches of water with the polish floating on top. You will just need to find a tub or basin large enough to allow the furniture piece to be dipped into. Good luck! Gorgeous. But how did you hold everything to avoid spoiling the pattern with your fingers? I’m just not as graceful about these things…. This is beautiful! I definitely want to try something similar for a DIY project soon. Thanks so much for the inspiration! Beyond amazing. Love the effects you got! LOL *gold* leaf, but *God* leaf sounds pretty awesome! Very nice idea. I will definitely try this. Thanks for sharing! This is amazing! Easter eggs, here we come! Perfect use of my old nail polish, which, sadly, my knobby working hands look silly wearing these days! Thanks for the great tutorial! I can’t wait to try this. As Holly said in the comments, it’s a great way to use up all of my nail polish! Also, just found your blog and I love it! 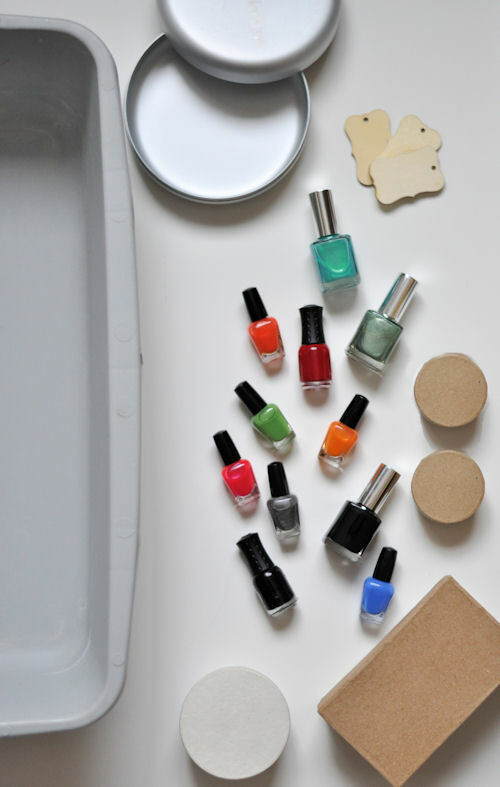 LOVE this idea—I’ve recently begun to use gel nail polish….and have stashed of the “regular” stuff I hate to see go to waste–I’ve been looking for something like this. AWEsome–thanks for sharing. What a sad waste of Zoya and Orly. DO you people have no respect for nail polish? Данная техника известна в России давно. При дефиците обоев по такой технологии делали самодельные обои под мрамор. Применяли не лак для ногтей, а масляную краску. P.S. Добавлю, применение масляной краски значительно дешевле. I see marbled flower pots in my very near future…been looking for something neat for my stargazer lily bulbs to grow in..thanks for the inspiration!! keep up the creativity!! they turned out amazing! thanks so much!! You can also spray alcohol ( perfume or a spray hand sanitzer) across the surface of the polish to form spots. The polish doesn’t mix with the alcohol, but instead where each droplet of alcohol lands the polish shrinks back forming a circle. This method is so stunning used on nails also!!! I LOVE this idea. Thank you so much for sharing!! The water ratio depends on the size of the bird bath. Whatever the depth/size of the object, you will need enough water in order to dip the surface. As for a finishing product, I have no idea. I have never used this method for an object outside. If you do experiment, I’d love to know what you find. 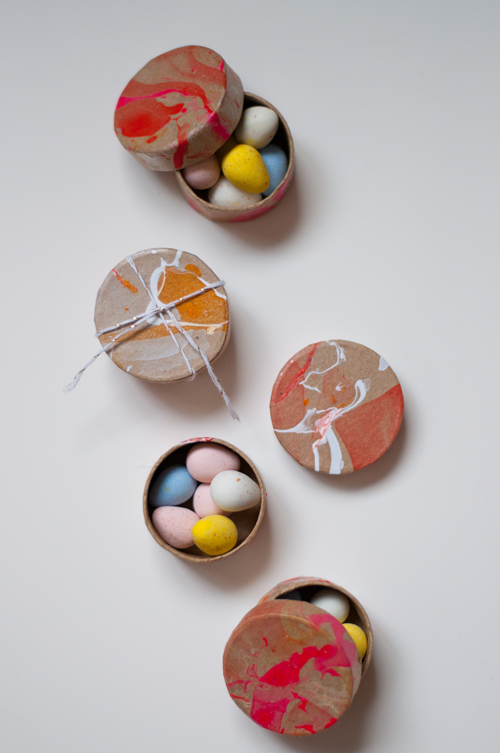 Easter Decoration: Marbled Votives. | blue. white. striped. I absolutely love this idea. I wanted to know if there is any material which just won’t work for this technique. I mean, obviously it has to be able to get wet, but apart from that is there any object to which the polish just wont stick? oh no! Any more info you can share that could help me diagnose an issue? Please do answer my question as I really do want to try this, but I don’t know what to use to get it out of the water after the pattern is on the object…I want to try it on some large round pearls to use for jewelry…thanks so much.. I agree. It turns out so pretty, I love it. Can you do this with frames?? Tried using “ICE” nail polish- 2 kinds- matte and glitter look.. Found at walmart on sale. It hit the water and seems to become plastic, didn’t spread out. I wondered if the water was not the right temp, so it is sitting to become “room-temperature” – until I try again. Really like this idea, so I want to try again. I wonder if the nail polish just doesn’t work. My Grandmother left me her antique rocking chair, circa 1910. I’m dying to try this technique on that! I think my bathtub should be large enough to hold the rocker. Any thoughts/suggestions? Four *NEW* ways to decorate Easter Eggs! Thank you for this great tutorial! I can’t wait to try it!!!! Hey, this is absolutely beautiful. Does this work on fabrics too ? if yes, what kind would be the best ? 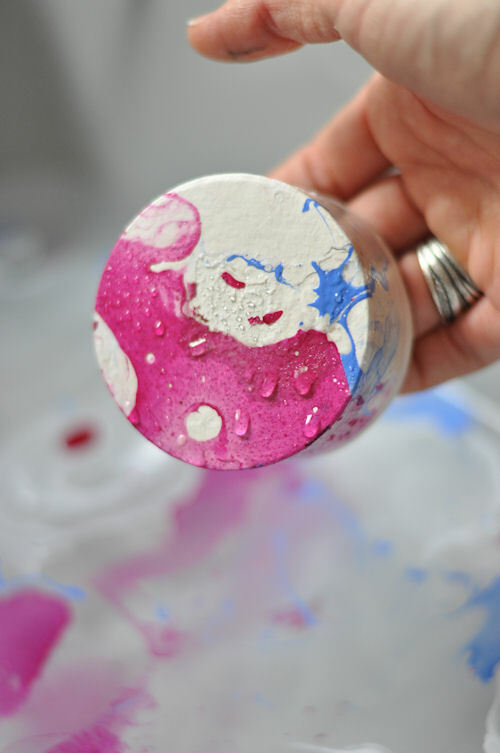 Marbleize anything with Nail Polish! I tried this technique last night, and I had some troubles… I didn’t expect the polish to dry so fast! I found myself trying to get the object dipped in about 3 seconds or it would pick up thickened strands of polish, or completely engulf the object in a solid color (no marbling). Does it matter what temperature the water is? If, when dipping the item, it picks up some hardened polish, how do I keep it from looking terrible? Also drops of water turned into bubbles of air. Did you face any of the problems? Thanks! I had similar problems. I read another tutorial that insisted the water be room temperature. It didn’t matter. I tried old and new nail polish that was not quick dry. I got a webbed blob of gunky polish. After several attempts, I got a thin layer on a small area of a clay pot. Tried it again. When the water hit the clay, the polish released from the pot. I don’t give up easily, but I did on this one…. I’ve used other materials to marble items before, so I guess nail polish is one method I’ll leave alone. I’d really like to know what the problem is, because I love the look, but it Looks like all of the last comments didn’t get replies….. bummer. Good luck! This is amazing! just a quick question…can you do this on fabric? Oh my goodness… This is so fabulous! I’ll try that. any kind in particular? This is the coolest thing ever! I love it. I want to thank you. I had such a hard time with the nail polish. Could be old ($1 Store), but the colors were FAB!!! I warmed up the water and it behaved better. However, I, like a bull in a china shop, swirled that dammmm toothpick. No, like a flower, swirl, lightly, not like a machinist. That doesn’t say masochistic, think machine repair, ;-). You really did help me and I made one semi good plate today. Thank you for your clear instructions, I truly appreciate it. I love this idea! Tried it and it works beautifully but it tries with water marks which are not so attractive. How do you get rid of them. Thanks for any advice. I know you said anything but can you use it on silk scarves? Beautiful! Just wondering what you do with the nail polish water after? is it safe to pour down the drain? i did what you instructed, but when i tried to mix the colours, the skin was set, the skin stuck to the skewer and lifted off, maybe the cheap nail polish..? Question.. what do you do with the left over polish/water bath? How do you dispose of it safely?